We truely have an abundance of bird life here at Caudo Vineyard. If you visit on the right day, you might witness what we see all the time- the raw beauty of Mother Nature. Pelicans constantly fly in and glide along the stretch of river near the cellar door. If you happen to have a carp on the end of your fishing line they will become your best friend. The kookaburras laugh in the early hours of the morning, we would like to know what’s so funny. We also have a pandemonium of native parrots that enjoy the olive trees. You have to be sneaky to catch a glimpse of them. 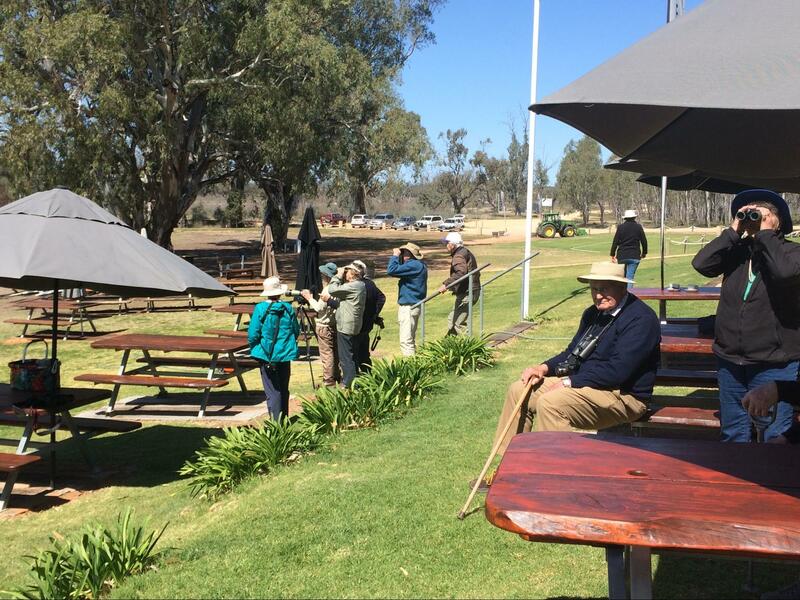 Twenty bird watchers from Adelaide visited on Wednesday. A beautiful peaceful morning birdwatching quickly turned into an action scene as a kite swooped into a paddling of ducks on the river, taking a duckling for brunch. What a commotion it caused. Unfortunately, he couldn’t duck in time. Yet another good weekend of weather ahead to look forward to. We are firing up the wood fire pizza oven again both Saturday and Sunday. If you haven’t tried our new homemade pizzas, pop into the cellar door over the next few weekends. They are a treat. Local band The Offshoot is playing next weekend for the long weekend at the Cellar Door. We are gearing up for a great weekend as people start to hit the river and get out to enjoy this beautiful Riverland sunshine. We have woken to a few cold mornings in September. This is due to a high pressure system bringing in winds and cloudless weather. The cold isn’t over yet with more mornings expected to remain chilly in South Australia. Sunshine galore for the weekend ahead. A top of 22 tomorrow with light winds up to 15km/h. Saturday and Sunday will be very much the same with the winds easing over the weekend. We look forward to longer days and shorter nights after the equinox. The sun will continue to rise each day from this point and bring in the much anticipated summer weather. This means more daylight hours to enjoy a Caudo Sangria- Great News!! Have you tried our new Royal Tea range? Introducing RoyalTea Blueberry Rose and RoyalTea Golden Peach. Caudo Vineyard’s popular rose, infused with the blackest tea and fresh blueberries, is sweet, fruity and incredibly refreshing. RoyalTea Peach is golden in both colour and taste. Made with our lightly spritzed Caudo Vineyard Chardonnay, it has a peachy punch that will have you wanting more. Pop one open and enjoy the taste of royalty. Available now in the Cellar Door. The Riverland Farmers Markets is on every Saturday 7.30-11.30am at Berri Senior Citizens Hall. Find freshly grown Riverland produce and unique products from locals. Breakfast available. The Revolving Wardrobe Markets at The Lutheran Peace Hall in Loxton is a unique, eclectic fashion based market with vintage and pre-loved clothing, fashion, accessories and food. Check it out 10am until 3pm. During early spring when the temperatures start to rise so do the number of snake sightings. Now is great time to clean up the backyard; cut the grass short, tidy sheds and eliminate sources of cover where snakes can hide. There are ten locks and weirs along the Murray River between Wentworth and Blanchetown. These were constructed between 1922 and 1935. Each weir has a lock constructed next to it, to facilitate navigation. The first weir built was at Blanchetown. At 168.85 metres, it is the widest weir on the River Murray. It is worth a visit if you have never seen one before. Herman Wattchow was a stonemason and built the original homestead in 1886, this is now used as a private wine cellar. Up to 7 people lived in this tiny cottage until 1902 when he finished the current homestead you see now and where Joe and Christine Caudo live. How amazing both these still stand through 2 floods with zero maintenance!! Herman also helped to build the Largs Pier Hotel and was one of the very first shareholders in the Terminus Hotel of Morgan. Ironically, both of these pubs now stock our products. It is amazing to have a real close look at all of the places and see the similarity of the stone work. The River flat in front of the house where “The Sentinels” (three Gum Trees) stand is still called Wattchow’s Landing. We hope to see you next weekend for a big weekend of great food and local entertainment.